If ever there was a reason to be cheerful, it’s a good beer. A pint of something lovingly crafted, served at the right temperature. Something Belgian, perhaps… I got into brewing at University when it was far cheaper to brew my own than to buy it from the supermarket or the student bar. After a brief hiatus in Kent (where the water’s not good for brewing unless you’re Shepherd Neame) we started brewing again here in Shetland. Bitters, ciders, wheat beers, barkshack gingermeads, experimental pale ales, the list goes on. Right now we’ve a couple of kits bottled, they’ll be ready to drink round about the end of March. Life is good. 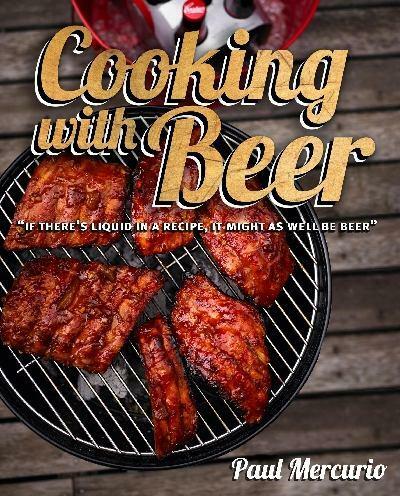 It’s an Australian book, by an Australian chef, but I knew I’d get on with him from the sub-title: “If there’s liquid in a recipe, it might as well be beer.” Noble sentiments indeed. In fact the book’s full of advice like that – “If there’s any left over, drink it” being one that crops up time and again. 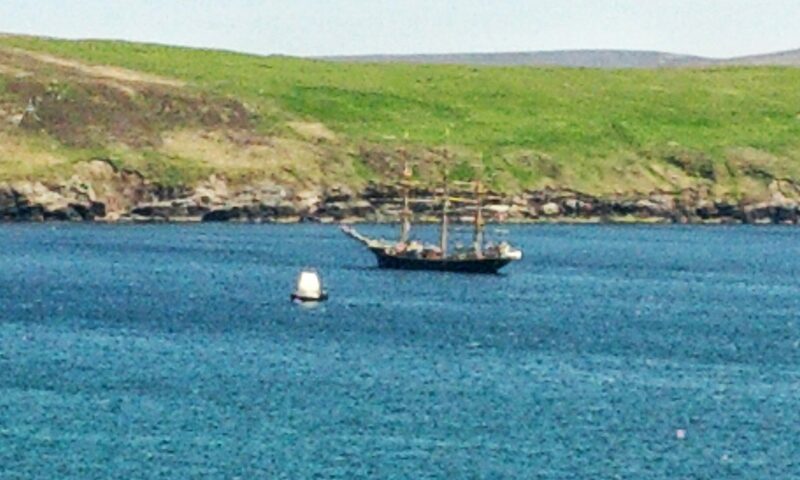 Granted, the last time I did that it was a little like Baldrick’s short holiday in Blackadder. 1 fluid ounce of beer was left. So I drank it and enjoyed it but it did leave me wanting to open another bottle. Paul starts off with an overview of beer and a wonderful rant about how the mass-produced stuff isn’t really beer at all. As someone who was a member of CAMRA and likes Real Ale in general, I salute this 100%. He then eases you gently into the swing of things with a chapter on recipes that work well with beer but don’t actually contain it. All well and good. Moving through the book he takes us from nibbles, through the stove, into the oven, onto the grill and finally to dessert and baking. There doesn’t look to be a bad recipe in the book, although some of the ingredients might be hard to get hold of here in the wilds of Shetland – once you’ve worked out what the English for flathead tails is (some kind of fish, apparently). The range of recipes is amazing, running the gauntlet from American ribs (as pictured on the cover), through assorted curries – both Indian and Thai, on into risottos, pastas, paellas and chilli. He cooks fish, goat, octopus, quail, rabbit, lamb (in Guinness, no less, along with a superb Moroccan tagine) and more. He gives us ice creams, soups, birramisu, beer breads, and more. Each recipe includes notes as to which beers work best. You can tell he’s done his homework, long hours spent testing each one with the ranges of beers at his disposal. For the UK, there’s plenty of Belgian and German beers in play and even I can get hold of those on this rock. And if I don’t have the right one, I’ll substitute something from my own cellar. Meanwhile, heath the olive oil in a saucepan over medium-high heat. When the oil is smoking, add the onion and cook, stirring, for about 5 minutes. Stir in the garlic, pepper and chorizo and cook for another 5 minutes. Stir in the paprika, then add the saffron and its soaking liquid and stir it through. Add the bay leaves, thyme, tomato and sea salt to taste. Stir to combine then cook for several minutes. Pour in the beer and stock and bring to the boil. Season with freshly ground black pepper, add the sherry vinegar and stir to allow the flavours to combine. Add the lentils and mix them through while the liquid comes back to the boil. Turn the heat to low, cover with a lid and simmer for 1 hour. Stir in the mushrooms and courgette, put the lid back on and simmer for another 45 minutes to 1 hour, or until the lentils are tender but still have a little bite. If you have too much liquid, take the lid off and simmer over a higher heat to reduce it. Enjoy with a glass of the ale you cooked the lentils with. Serves 4. Allegedly, but I reckon we’ll feed all 7 of us happily tonight with this. But then 5 of them aren’t adults yet. I did the lamb tagine from this book last week and it was superb.